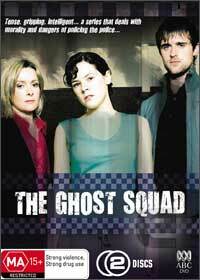 The Ghost Squad, not to be confused with the Black and White series "Ghost Squad" is the new BBC series that stars Elaine Cassidy as Amy Harris, a young undercover detective who journeys into the world of corruption and violence. The Ghost Squad was an underground unit that was designed to investigate police corruption, however due to complaints by officers, the Ghost Squad was allegedly disbanded. Unfortunately for our heroine, Amy is drawn into the Ghost Squad that apparently does not exist and uncovers a dangerous behind the scene world that the public do not realizes exists. Featuring a strong supporting cast starring Emma Fielding as the Detective Superintendent Carol McKay and Jonas Armstrong as Peter, they indulge in the world of murder, corruption and justice that proves that nothing is ever just black and white. A Gripping drama series that has been exceptionally cast, directed and written which will leave the viewer wanting more. Bring on Season two because 389 minutes is just not enough of the Ghost Squad.